Back pain in pregnancy is a common complaint we see at Gorey Family Chiropractic Clinic, complicating approximately half of all pregnancies in Ireland each year. 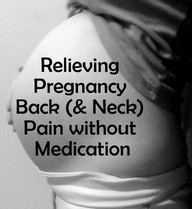 For pregnant women, back pain during pregnancy is not a trivial matter. Left unaddressed, pregnancy back pain can have a negative impact on your daily lifestyle, from causing missed time from work, affecting looking after other children, to making your delivery more difficult. To help make your pregnancy as pleasant as possible and facilitate an easier delivery, it is generally recommended that back pain should be always be addressed as quickly as possible and managed throughout your pregnancy. Lower back pain in pregnancy that lasts a long time (several weeks or months) is a predictor for postpartum back pain (pain after birth). For this reason, pregnant women are encouraged to look after their back whilst pregnant and to seek guidance and treatment where appropriate during pregnancy for back pain. A physically strenuous occupation, for instance a job with lifting or standing involved or even a pregnant mother caring for other small children can increase the risk of back pain developing in the course of a pregnancy. Previous injury to the back or pelvis from an accident or trauma is another known predisposing factor in the development of back pain in pregnancy. The causes of back pain in pregnancy are largely related to problems with two structures in the lower back, the sacroiliac joints and the lumbar spine. 1. As a mother’s abdomen grows during pregnancy, the center of gravity in her body is forced to change in response to the increasing weight of the baby coupled with the weight of the amniotic fluid, sac, placenta etc. This increasing weight pulls forward and the pregnant mother is forced to increase the curve of her lumbar spine to compensate. 2. The sacroiliac joints, an attachment point of the pelvis to the spine can frequently become unstable in the latter stages of pregnancy. These joints, already under considerable pressure from the increasing weight of the bump, are affected by the hormonal changes a women’s body goes through during the second and third trimester of pregnancy. The pregnancy hormones affect the laxity of the ligaments that connect the sacroiliac joints to the spine. This occurs so that the pelvis may expand to allow the passage of the baby downwards through the birth canal so as to facilitate giving birth. However this process creates significant instability of the multiple ligamentous structures at the very same point when these structures are under pressure from the increased weight of the abdomen. 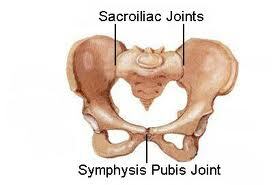 This ca n give rise to a condition called Symphysis Pubis Dysfunction or SPD. The pain from this disorder can radiate to your thighs, and some women feel or hear a clicking or grinding in the pelvic/ pubic area. • Turning over in bed and it can also be difficult to move your legs apart, for example when you get out of a car. There is treatment to help, and techniques to manage the pain and discomfort. If you get the right advice and treatment early on, SPD can usually be managed and the symptoms minimised. 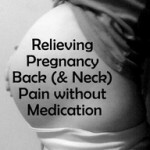 How Can Pregnancy Related Back Pain be Treated? Firstly if you a re intending to get pregnant pre-emptive treatment through exercise is extremely beneficial particularly if you are a sufferer of back pain prior to pregnancy. Where possible try to strengthen you core before becoming pregnant. Developing strong core musculature helps support the spine, baby and eases the pressure exerted on the lumbar spine and sacro-iliac joints. Our Gorey Family Chiropractic team may utilise different tailor made treatments for pregnancy back pain, including specific advice& instructions on how to address your individual back problem yourself. This is determined following a thorough assessment and evaluation and has been shown to be a safe effective way of easing the pain coming from structures such as the muscles, ligaments and joint of the spine and pelvis. Equipment if necessary such as pelvic support belts. Supportive belts that take the strain off the sacroiliac joints can be very helpful in controlling the instability of the sacroiliac joints. Your chiropractor or other prenatal healthcare professional can advise on sizing and fit if these are appropriate as well as instruct you on how to use the belts correctly to maximum effect. Advice and instructions are also given on proper posture’s while pregnant. i.e how to sit, stand sleep to take strain off the spine as well as considering specific ways to perform routine activities, such as housework; how to sleep comfortably, lift and bend safely. When to Get Help for Low back or Pelvic Joint Pain? Getting diagnosed as early as possible can help keep pain to a minimum and avoid long-term discomfort. If you are pregnant and suffering from low back pain or pelvic / sacroiliac pain and are based around Gorey, Enniscorthy, Wexford, Arklow, Wicklow or Carlow it may be time to be professionally evaluated. Why not call Gorey Family Chiropractic today to make an initial consultation appointment. For your convenience all of our Chiropractic team are registered with VHI, Aviva and Laya Healthcare allowing clients claim reimbursement from a wide range of private healthcare Insurance providers. This entry was posted in Back Pain & Pregnancy and tagged avoiding back pain at work, back ache, back exercises, back pain and sport, back pain with pregnancy, backpain, chiropractic, chiropractic wexford, chiropractor, chiropractor Gorey by admin. Bookmark the permalink.